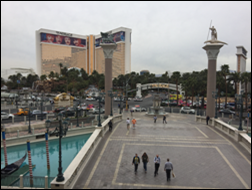 The second full day of HIMSS dawned with overcast skies and a slight chill in the air. As the week wears on, I grow happier that I decided to book a room next to the Venetian. My morning commute clocks in at around 10 minutes on foot. It’s been nice not having to wait in taxi queues or shuttle bus lines. 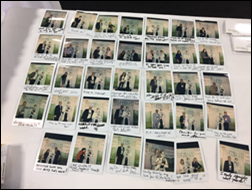 A quick check-in at our booth found our pile of Smokin’ Doc Polaroids growing larger. 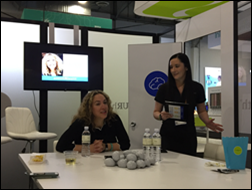 (Stop by booth 11228 for the inside scoop on what we’re doing with them.) The cameras – $99 from Best Buy – have been conversation starters all by themselves. They are indeed more novelty than anything else, given their cost and the time it takes for the image to develop (longer than the original Polaroids, I’m told). 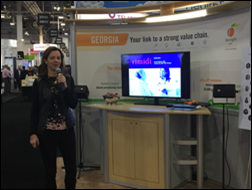 I try every year to show my home state some love, and so stopped by the Georgia Pavilion to hear Atlanta-based Rimidi founder Lucienne Ide, MD present on the way FHIR is powering the chronic disease management company’s technology. The company’s solution, which right now is focused on diabetes and heart failure, is aimed at helping physicians close care gaps. Clinical communications company Doc Halo, along with Waystar, splurged for a digital billboard that greets travelers as they leave the airport and head toward the strip. I’d be interested to know what kind of ROI they expected (increased foot traffic at their booth?) and what they got out of that type of signage. HealthTap pulled me in with its unique Lego theme and surprisingly tasty kale-based juice. Product Manager Subarna Mitra patiently walked me through a demo of their “Query to Care” capabilities, which offer patients personalized care plans and algorithm- and text-based triage – all of which a provider can purchase as a white-label solution that feeds a patient’s app activity into their EHR. 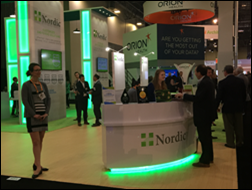 Nordic’s booth seemed to have steady interest. I noticed they weren’t giving out branded coffee beans this year. 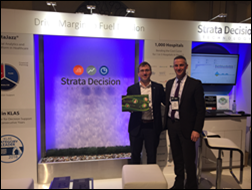 I had a chance to chat with Strata Decision Technology CEO Dan Michelson (right) as I was dropping off their booth sign. He tells me they are using the same booth as they were five years ago. 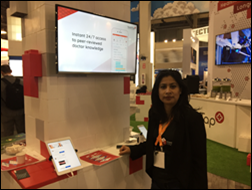 “Why spend money on a new booth,” he asked, “when you can spend it on giving your customers what they want?” I don’t think they need to change a think. The water wall was particularly soothing amidst the exhibit hall hustle and bustle. 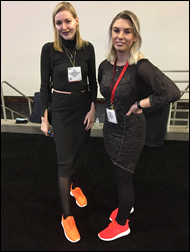 The ladies of VitalHealth were sporting such brightly hued sneakers that I just had to stop and snap a pic. Apparently their entire booth staff are similarly shod. This type of footwear makes so much since. I have literally winced after seeing women walk by in high heels, knowing the agony their feet will be in by the end of the day. I loved the mod look of these Protenus meeting pods. I’ve noticed many booths seem to have upped their furniture décor this year, particularly in the seating area. Even the HIMSS Living Room looks like it was inspired by Magnolia Home. 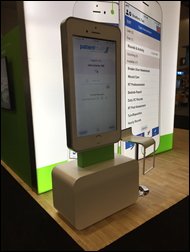 PatientSafe Solutions had the biggest iPhone I’ve ever seen on display. 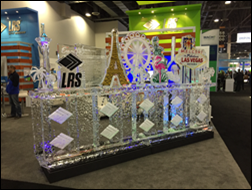 This ice sculpture literally stopped me in my tracks. I didn’t even think it was ice at first, until I noticed the dripping bottom. LRS provides document output management services for Cerner, Epic, GE, and Siemens. 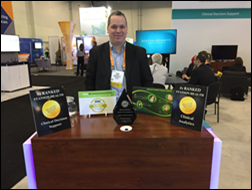 I liked the way Stanson Health had its HIStalk sign cozily tucked amongst its awards from HIMSS and Black Book. 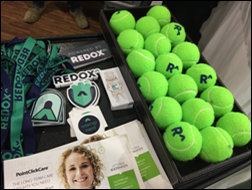 Redox drew me in with its tennis ball dog toys. Its office is so dog friendly that it has created a company calendar featuring the dogs of its employees. I suggested they add a canine-focused charitable effort to next year’s edition. AssessURHealth seems to be making important headway in generating awareness around the need to end mental health stigmas. 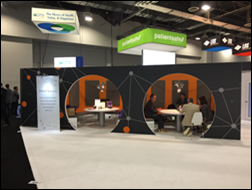 Its “Shock Wall” highlights the number of people who have died from suicide, opioid overdose, and alcohol abuse since HIMSS opened at the beginning of the week. It’s a pretty sobering statistic, reinforced by the fact that every employee I spoke with had a personal story to tell of a friend or family member who has suffered from or succumbed to mental health-related conditions. Kudos to them for their #EndTheStigma campaign. I popped in to their conference room to attend an intimate talk with McKinsey Senior Expert Jessica Kahn (left). As a former CMS director of data and systems for Medicaid, she had unique insight to share on the challenges Medicaid providers and their patients face when it comes to implementing and accessing behavioral health technology. 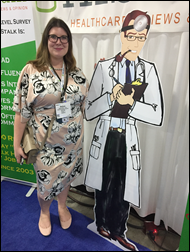 She is a big believer in the role telemedicine has to play in bringing much-need mental health services to Medicaid populations. 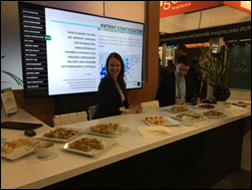 Another round of booth time found me chatting almost non-stop with readers and sponsors like Reaction Data Marketing Director Taylor Madsen and Gwinnett Medical Center (GA) SVP and CIO Patty Lavely. 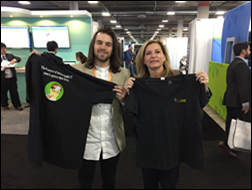 They seemed to like the shirts we’re giving out at the booth (112288). Last year’s Miss HIStalkapalooza winner Bethany Miller-Urroz stopped by to see if her reign was technically over. I say, if the sash still fits, wear it! She was bummed she didn’t think to bring it to HIMSS this year. I’ve noticed several exhibitors using paper to highlight their digital processes. 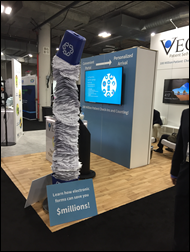 One company several rows over from ours seemed to be having fun luring attendees in to bash open its fax machine piñata. 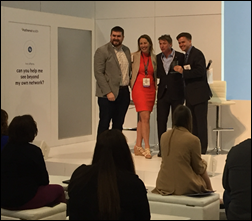 My last foray into the exhibit hall gave me a chance to catch the Healthfinch team accepting an innovation award from Jonathan Bush at the Athenahealth booth for its Charlie Practice Automation Platform, which makes refill management and visit planning in EHRs more efficient. Afternoon happy hours got started around 4:30. Arcadia had by far the fanciest appetizers – in both presentation and ingredients – I’ve ever seen at a tradeshow. 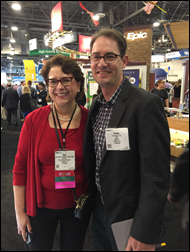 I find myself running into friends and colleagues like Starbridge Advisors Principal Sue Schade and Datica CEO Travis Good, MD who, unbeknownst to me, already know one another. 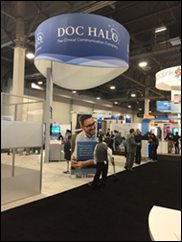 Health IT can seem like a very small world at times, especially when surrounded by 43,000 of your closest colleagues. 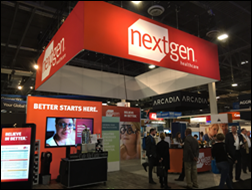 NextGen’s newly rebranded booth looked nice. The CoverMyMeds end-of-day soiree was busy. 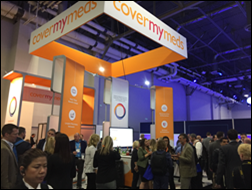 Company reps were no doubt bringing customers up to speed on their new, real-time prescription benefit solution developed with RelayHealth Pharmacy Solutions. Tomorrow promises a slightly quieter exhibit hall, given that many vendors will start packing up early to head home. 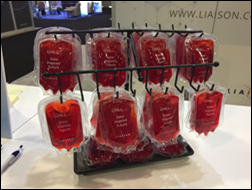 I hope to stop by the Interoperability Showcase and Connected Health Pavilion, though HIMSS has a habit of pulling us all in a million different unexpected directions. Feel free to email me with your suggestions of can’t-miss exhibits or sessions for Thursday. 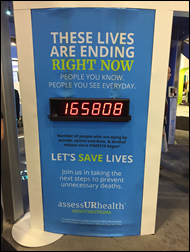 The photo of AssessURHealth’s shock-wall is indeed shocking; I know a couple of families devastated by this and still had no idea that a 3 day total would be 165808; Did they say how this was calculated?